Democratic Gov.-elect Tony Evers has appointed two new cabinet secretaries. At a press conference on Friday, Evers said that his new appointees would work outside silos to "connect the dots" and solve problems in Wisconsin. "Lt. Gov.-elect Mandela Barnes and I are very, very excited to honor these people and to introduce them to the people of Wisconsin," said Evers. Evers announced that Mary Kolar, a retired U.S. Navy captain, will serve as the new state Department of Veterans Affairs secretary. She said she will take an inclusive approach. 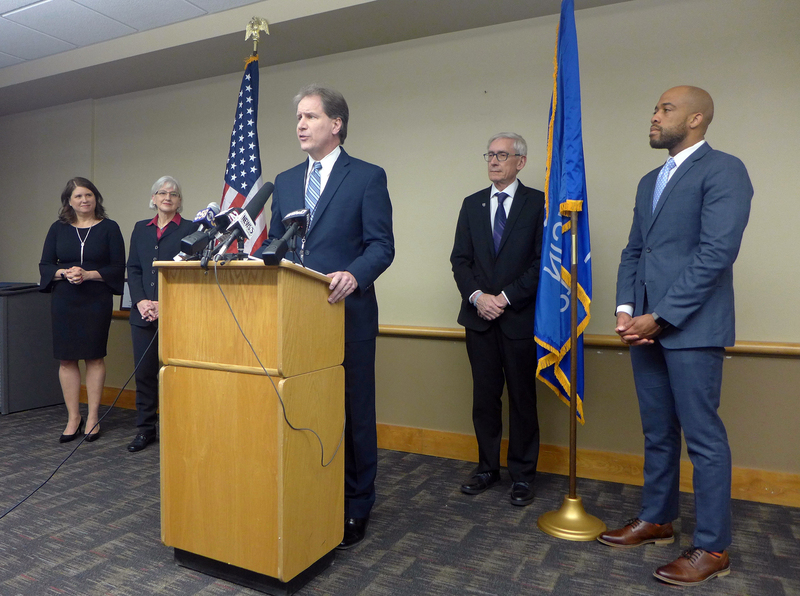 "As a team, the Wisconsin Department of Veterans Affairs will work with veteran service organizations and unaffiliated veterans to ensure all voices are heard," said Kolar. The department came under scrutiny in recent years after elderly veterans reportedly received poor care in a state-run facility. Kathy Blumenfeld, a vice president of a Madison-based benefits administration company, will serve as Department of Financial Institutions secretary. Evers also announced that Brian Pahnke, an assistant state schools superintendent, as his state budget director. According to Pahnke, the budget will be shaped by public input from listening sessions. Health care, education, transportation, infrastructure, tax relief and the environment will be priorities for what the administration calls a "people’s budget." "I look forward to working with you, Lt. Gov.-elect Barnes and others on your staff, with all members of the Legislature, in as collaborative a manner as we possibly can, to advance a bi-annual budget that reflects the interests and shared values of Wisconsin citizens throughout our state," Pahnke said. Evers appointed his first cabinet members last week, including Craig Thompson as transportation secretary, Preston Cole as Department of Natural Resources secretary and Kevin Carr as Department of Corrections secretary. On Thursday, he announced he will appoint Carolyn Stanford Taylor to succeed him as state schools superintendent after he is sworn in as governor on Jan. 7. Stanford Taylor currently serves as assistant state schools superintendent. She will become the state's first African-American schools superintendent.